Nolemana and I got an appraisal request in Dallesport, Washington, which, under normal circumstances, we never would have accepted because the town is an hour and a half from us. However, this client was absolutely desperate and agreed to pay us extra because of the distance and the time it would require. We like to help out clients whenever we can, and after being sick for so long, I thought it’d be a good idea to get the hell out of Dodge for a day. Besides, we’d never been to Dallesport before, so what the heck. Ho da rain!! 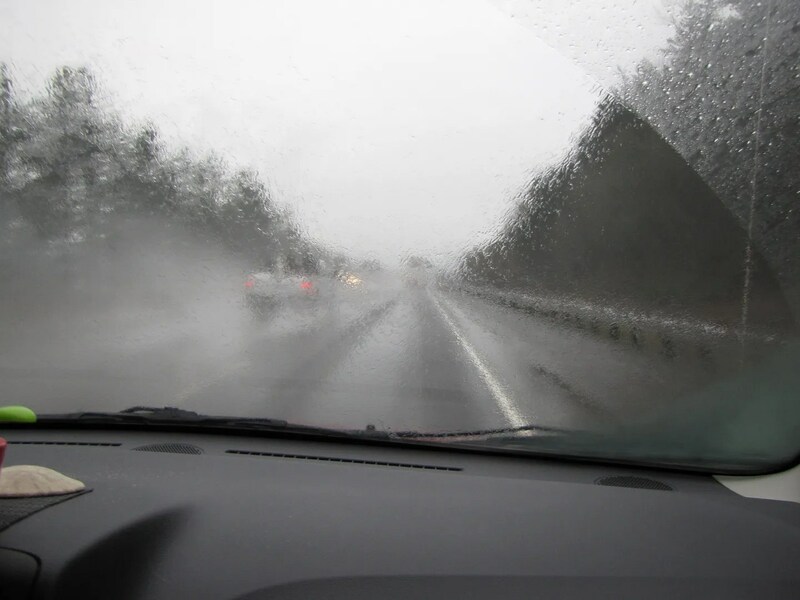 I had to be really careful driving because it was so easy for the car to hydroplane. No cruise control this time! Also, because the Port of Portland’s container terminal has lost so much business, there are ukumillion more semi trucks on the road. 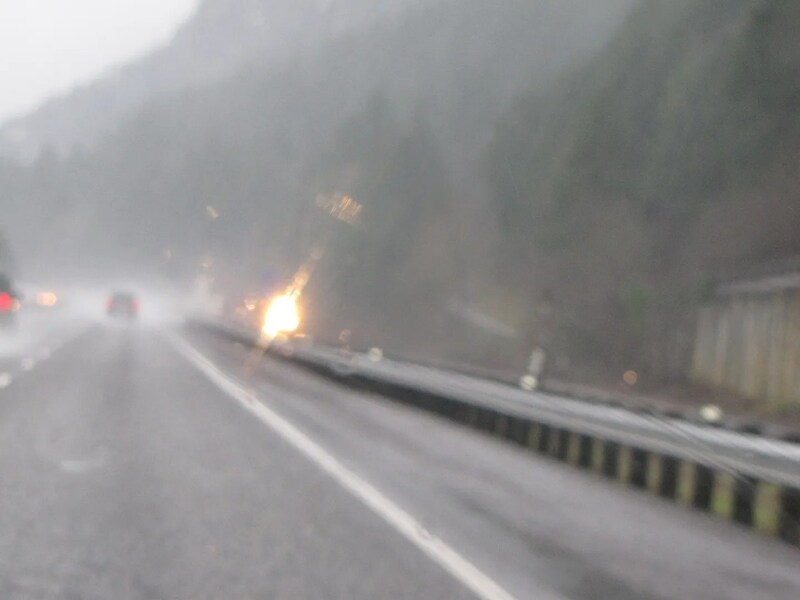 And that means a lot more tires whooshing water everywhere, even from the opposite side of the highway! Not only that, but there were a lot of stupidhead drivers going ‘way over the speed limit, which is 65 mph. See that pickup in the left lane up there? It zoomed by me so stinkin’ fast, spraying us with yep, water. I bet he was going at least 75 mph. And he wasn’t the only one, either. Even some of the trucks were going too fast. Shame. 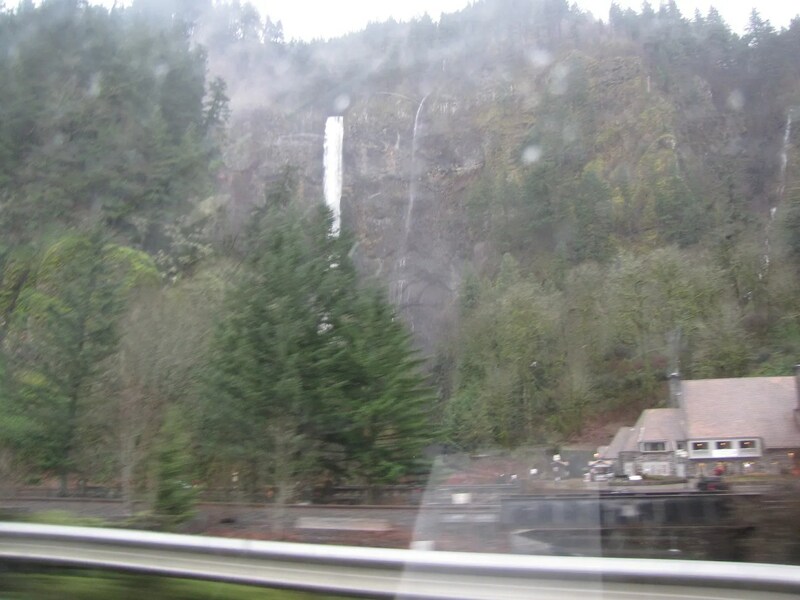 However, the waterfalls were plenteous and full, even through the really wet windows of our car. There were waterfalls where there usually aren’t any. 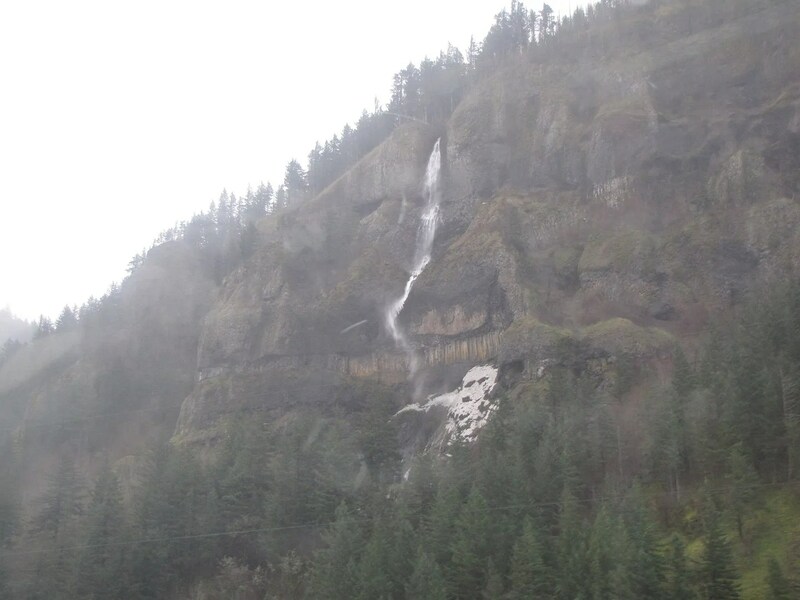 It was hard to get a good photo of Multnomah Falls, but Nolemana made a valiant effort to do so. A train! Can you tell? 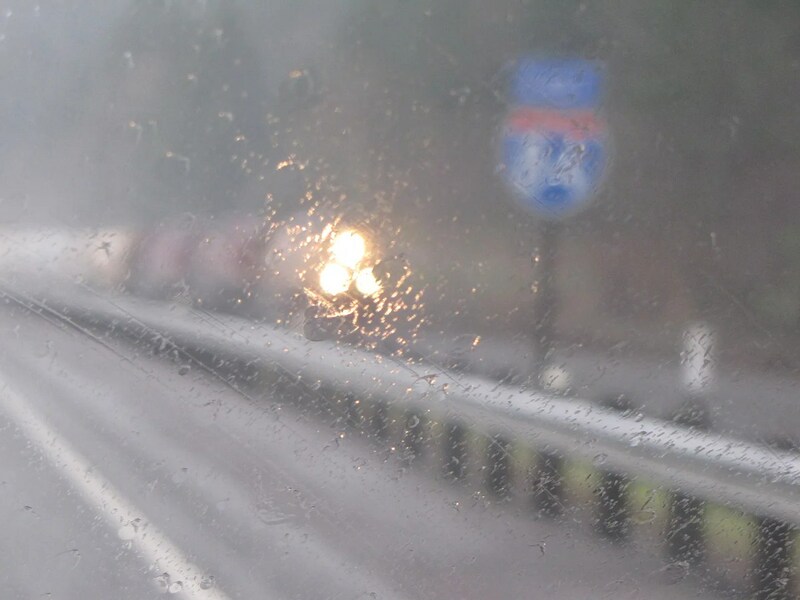 No way could he get a clear photo of it; it was raining ‘way too hard. But I really like this photo; it’s kinda surrealistic, yeah? 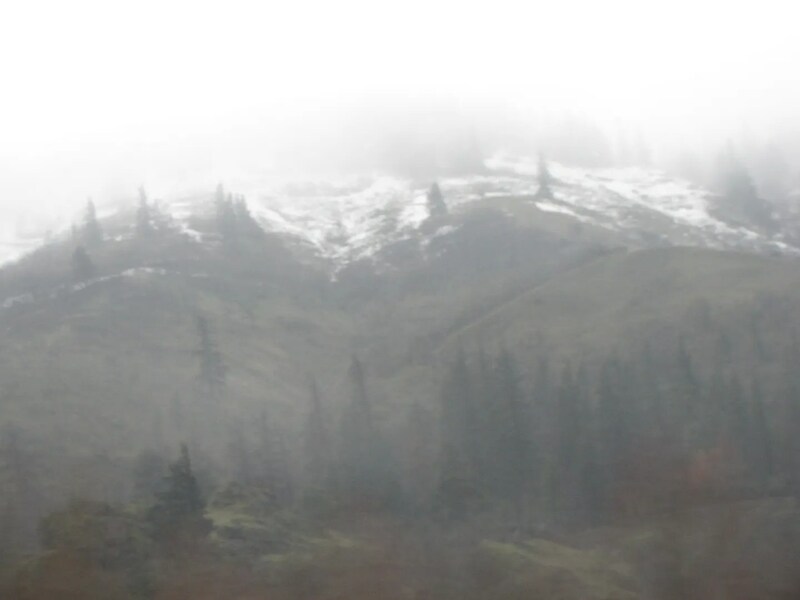 The rain clouds were hovering down into the valleys. 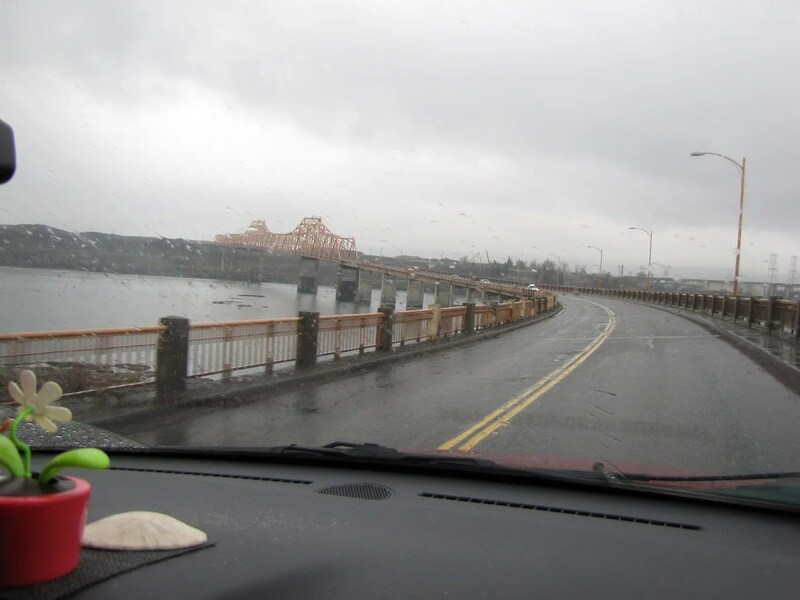 And there’s the Columbia River, believe it or not. Mayer State Park sign. 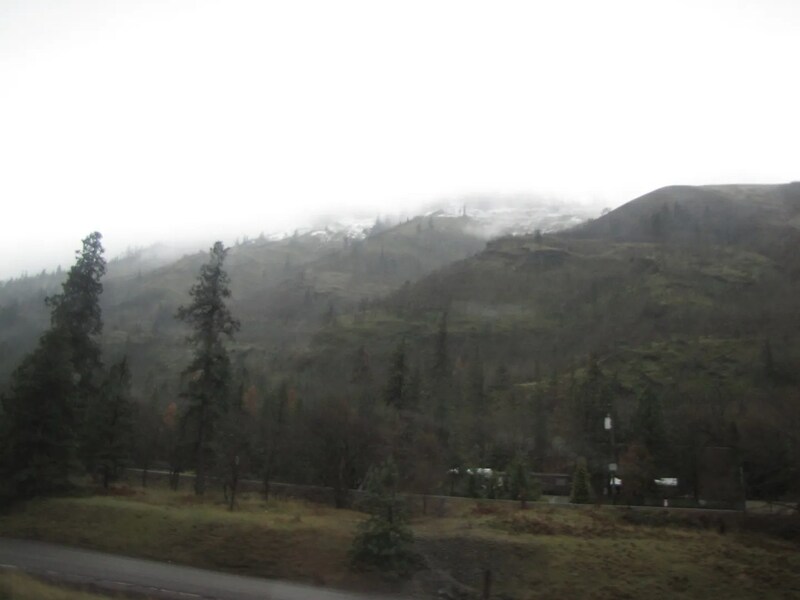 We’ve crossed the Cascades; this is near Rowena. 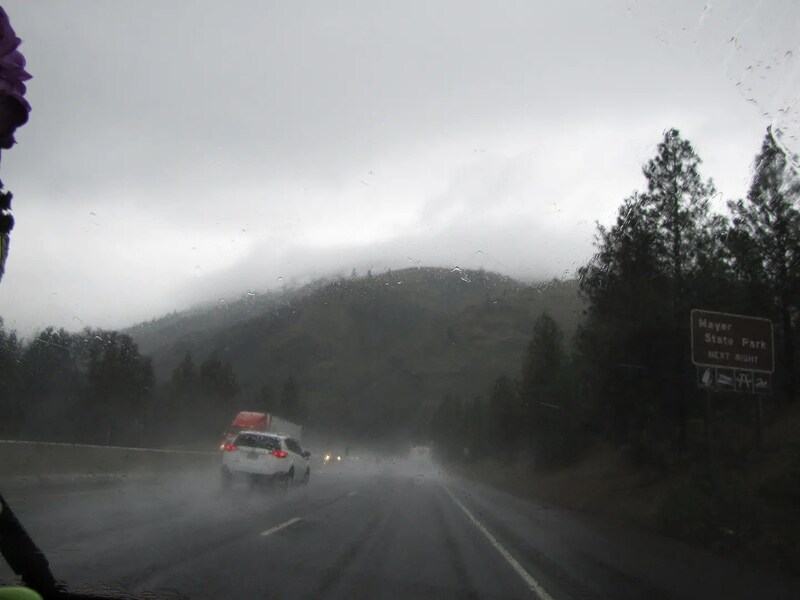 We were surprised that it was raining so hard on this, the drier side of the mountains. 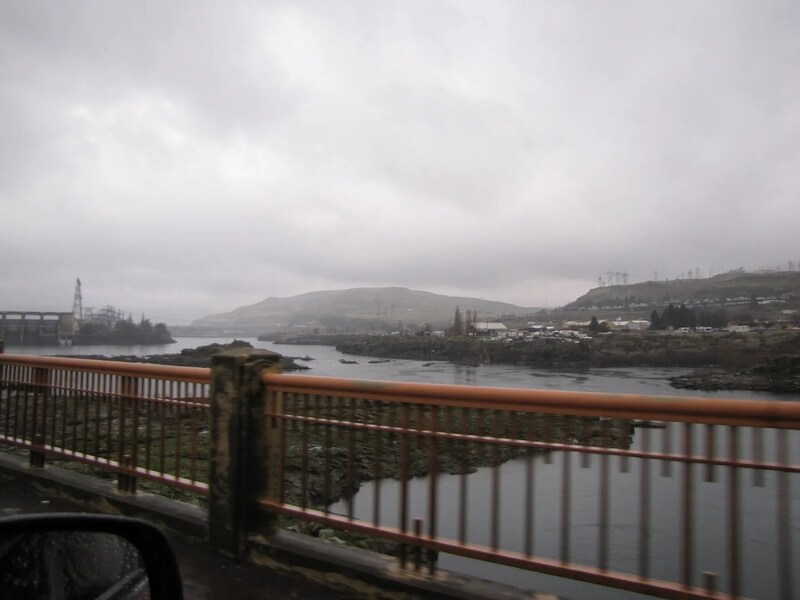 At The Dalles, Oregon, we headed north to cross the Columbia River. 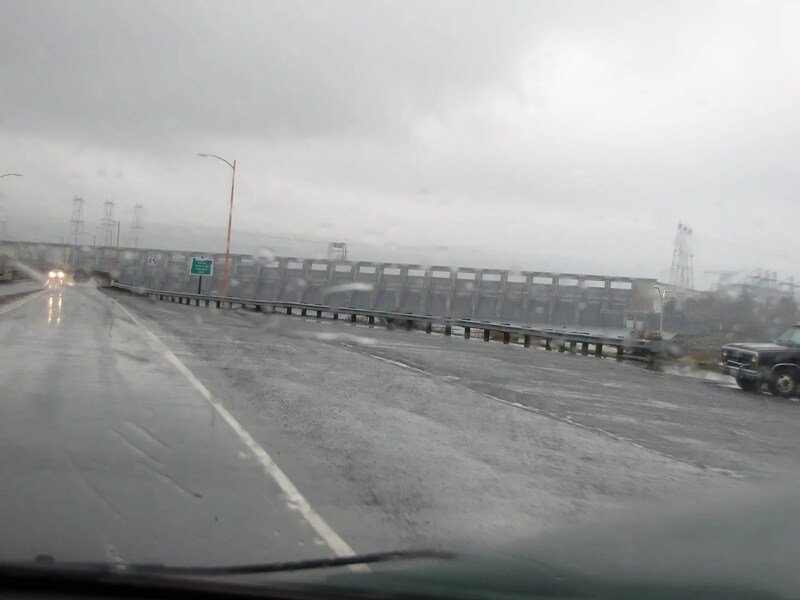 The Dalles Dam was to our right. And the main part of the bridge was up ahead. K’den. I’m gonna make a Part Two so I can get this published. See you on da bridge. This entry was posted in Da Kine: Sometimes Full-on Pidgin, Holoholo Pacific Northwest and tagged bridge, dallesport, rain, the-dalles, train. Bookmark the permalink. It was really scary when I moved here, and no more mauka, makai, etc. So confusing!! Now I can go mauka, then more mauka and if you’re between mountain ranges, is that mauka or makai? LOL. 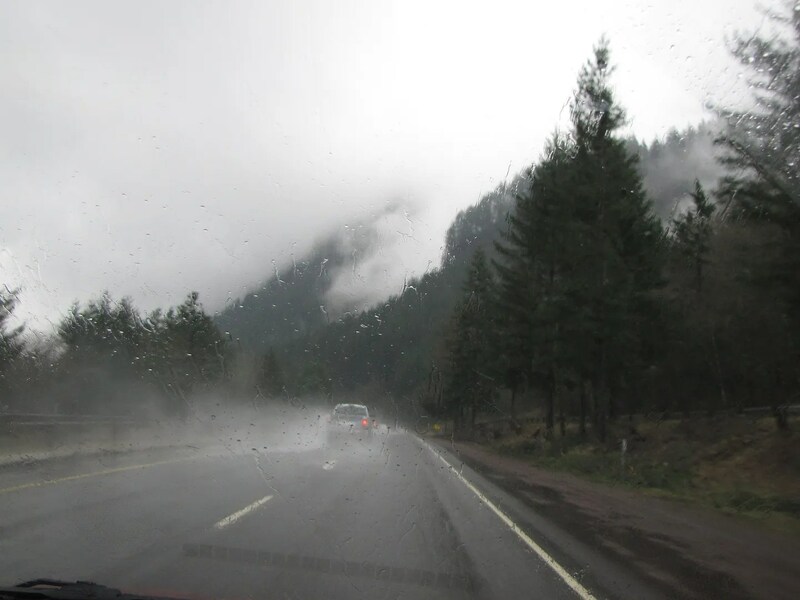 I love the mistiness too; it’s one of the things I love about the Pacific Northwest. I guess for the same reasons you do… reminds me of home. Mahalo for stopping by! We need da ua to keep us green! 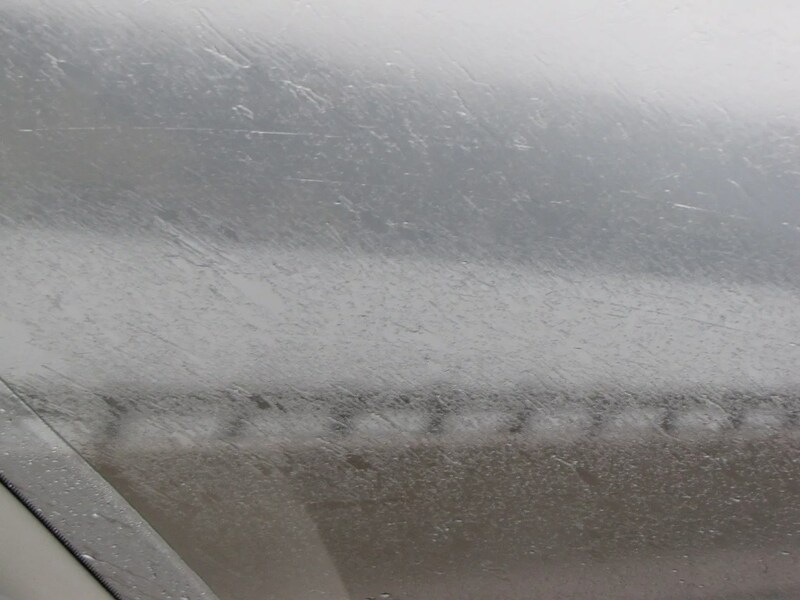 I like the shot of the train in the rain (ho, it’s one poem! )–it’s very dreamlike.